The hardest thing I’ve struggled with in “Holiday Wars” is the sound effects. In screenwriting you don’t use sound effects. The sound department deals with stuff like that. It’s not the writers responsibility. So when lettering, every time I come to a panel where one is needed I groan and role my eyes. It’s not the physical part of lettering the sound effect that I struggle with, it’s figuring out the right onomonopia to fit what’s going on. At first I would turn to my massive graphic novel shelf and skim through it for sound decent effects. However by the time I got this far into the story I would just kind of make up my own sounds. 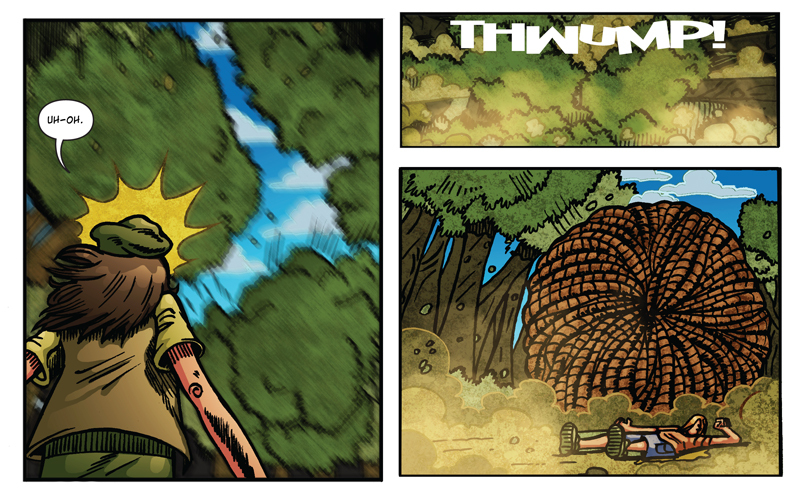 For example the THWUMP to me is a mix between THUMP and Spider-Man’s THWIP! New Vote Incentive: Curious about how hurt Wallace is? Then vote below to see a preview of Wednesday’s comic.